Fencers Joe Levis '26 and Hrant Isbenjian (1939). 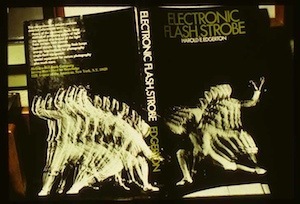 Doc Edgerton's 1970 book "Electronic Flash, Strobe." Have you been to the MIT Fencing Studio lately, at the DuPont Athletic Center? Check out Doc Edgerton’s multi-flash image of fencers from the 1930s used as inspiration for the studio’s renovation last winter. 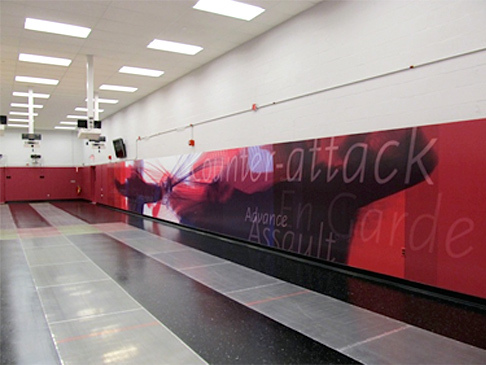 The studio, which hosts the Cambridge Fencing Center, has been transformed with an entire wall featuring a phenomenal 59-foot mural designed by Wing Ngan (Ink Design, Inc., 2011). The mural derives from an image that Doc Edgerton took in May 1939, when he photographed two fencers in action at his studio: Joseph Levis, a student at MIT in the 1920s and Silver Medal winner at the 1932 Olympics, and MIT fencing team captain Hrant Isbenjian. In fact Levis had started coaching the MIT fencing team two years earlier, in 1937. 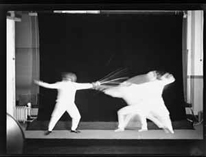 About thirty years later Edgerton chose a multi-flash image of fencers for the cover of his seminal book, “Electronic Flash, Strobe” (Cambridge: MIT Press, 1970). Over seventy years later, their lunges and thrusts provide a vivid backdrop to today’s fencers at the Cambridge Fencing Center studio. There are a good many Edgerton images around the MIT campus; this project is the latest addition. Can you locate all the other sites? This entry was posted on Tuesday, May 8th, 2012 at 12:36 pm and is filed under The Archivist's Blog. You can follow any responses to this entry through the RSS 2.0 feed. Both comments and pings are currently closed.